SMU postdoctoral researcher Aidan Randle-Conde, SMU Department of Physics, was quoted by the British newspaper The Daily Telegraph. Randle-Conde was quoted for his commentary on the search for the fundamental particle the Higgs boson and the media frenzy sparked in the days leading up to CERN's much-anticipated July 4 announcement of a new particle discovery. Telegraph science reporter Anjana Ahuja quoted in the July 3 article "Cern announcement: after 50 years, the Higgs hunt could be over." 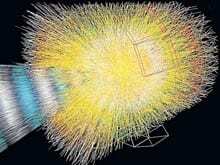 Physicists from SMU and around the globe were euphoric Wednesday with the historic revelation that a new particle consistent with the Higgs boson “God” particle has been observed. Described as a great triumph for science, the observation is the biggest physics discovery of the last 50 years and opens up what SMU scientists say is a vast new frontier for more research. SMU postdoctoral researcher Aidan Randle-Conde, SMU Department of Physics, posted about his experience working at the world's largest physics experiment at CERN on the blog Quantum Diaries. Randle-Conde's March 6 entry details his thoughts about "Cleaning the world's biggest machine," CERN's Atlas detector.